The Wedding! Someone elses style. Finally taking a weekend off from our full-tilt life. I think we took a weekend off several months ago in NYC and since then we have been on the go throughout months in Australia and now for a month in China. Today is five weeks since arriving on a Saturday morning at 2 am. We were so excited arriving in Dalian and meeting our new boss and entering our new home for the next couple of years. Since then we have had few stopping moments. It is after 8 on a Saturday morning and Narda is still asleep. I was up, as usual, before six. Every other weekend we have been off to Dalian or Kai Fa Qu on the schools shopping bus. During the week? Well we work and after school we are off to Kai Fa Qu on the shopping bus or riding our new bikes to the Jinshitan market, or walking to Golden Pebble Beach in the morning before school. It is not just us, half of the teachers are where we are too. Last night we walked the five-minutes over to the Blueberry Farm. The food is really very good there. It came out to be about $12 USD for Narda and I with about seven dishes, about one vegetarian. The eggplant and sweet potato are my favourites. The exciting new news is that we have found out what a big project going up across the road from us is. We have been watching a few French-type buildings go up and it does look like southern France. This is across from the large development called Chateau de Burgundy which I spoke about in my previous blog http://blog.neuage.info/?p=34 it is a winery that will be selling wine from the new Golden Pebble Beach Grape Valley vineyards, just a bike ride away. This will surely make the school day end that much more pleasant. Actually we found an Aussie pub, The Jinshitan Kangaroo Bar, (read about it on the Dalian Expat Page) a fifteen minute walk away on Jinshi Road at Jinshi square near Discovery Kingdom and the sprawling over the top Yosemite housing area for the Intel and other wealthy non-teacher types. Yes there is a Disney-like-theme-park just down the road along the beach from us. Narda and I will pop in someday when we need a break from whatever it is we would need a break from. According to a blurb I found online about the Yosemite development; The resort area is located approximately 40km away from the Dalian central city. Tourist attractions already established at the Golden Pebble Beach include: Golden Pebble Golf Club (on the top ten best in the world list), Golden Rock Park, Waxwork Museum, China Martial Arts Hall, Mao Zedong Badge Exhibition Hall, Model Art School, and the International Hunting Club. Oh yes there is a hunting club nearby  between the constant fireworks, the 24 hour a day building across the road and the hunting club nearby this gets to be quite the noisy place. It is a different noise than New York City  I have gotten use to it, though I do wake suddenly when a lot of fireworks are set off. There is a university  an art school, a technology college (this is Chinas Silicon Valley) and a fashion school  nearby and those students love their firecrackers. Another piece on Yosemite says The Oriental Yosemite is the biggest comprehensive tourism project in the Golden Pebble Beach State Tourism Resort. It is created by the Dalian Luneng Realty Co., Ltd. with 15 billion Yuan investment. A few days ago, another two projects were started. They are the Golden Pebble Commerce Centre and the Golden Pebble Ocean Hot Spring. 15 billion Yuan is 2,349,580,000 USD, so it is nice to know they are spending some money on housing in our neighbourhood.. There is a bigger project than Yosemite nearby and I will put that into a video I am doing of this area soonish. Other news: I got a soy milk maker for my birthday  and even though the instructions are in Chinese somehow I got the thing to make me a cup of milk from a cup of soybeans  seems like quite an effort but I know it is not going to have lots of other stuff in it. Another item to add to my tofu site at http://tofu.neuage.us It was more than thirty years ago when I started making soy milk and from that, tofu for eight years, in Adelaide and now I am in China with my little soy milk maker all these years later. Tonight I am bringing tofu burgers to our neighbours birthday bash. School is great  I will have some news about stuff regarding that in a couple of days. I am writing up on my educational blog http://neuage.us/edu/blog.html later today or tomorrow or sometime soon. Life is so different here at Campus Village. We seem to have lots of instant parties. Someones birthday and we swarm  beer is so cheap (though I am told not very good) here. Tonight it is actually a planned party, and I am making tofu burgers  seems I am stuck in my ideas of anything new. I never lived in a college dorm but I am told life in them is similar to this; a cross between a college dorm and a timeshare apartment. It seems we are on a permanent holiday. This blog is not really about all that is above. It is about the wedding we went to last Sunday. 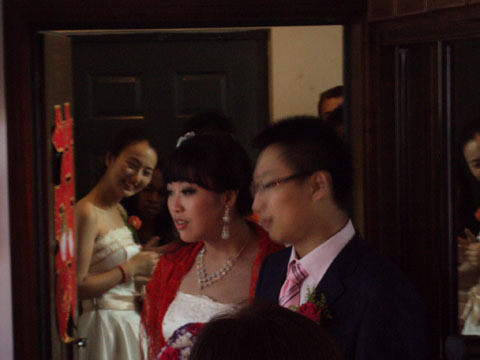 Our first Chinese wedding. Aside of leaving Sunday morning on the shopping bus to Dalian at 7.30 Am when all we wanted was a big sleep in we were most entertained. The groom was one of our IT staff. The first part was having a toast in the couples house. 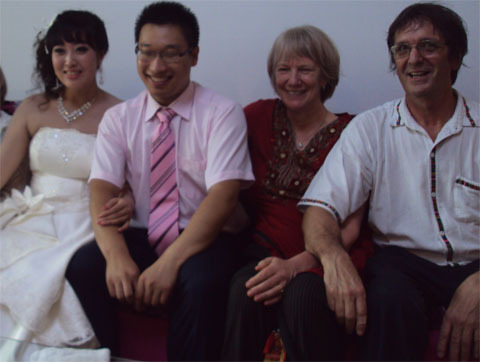 Marriage in China is a long drawn out event. They were actually married two months earlier, but the presentation or whatever it is  like coming of age or something was last Sunday. First of course was the fireworks  I will start my video off with that, which I hope to post tonight in between parties  after all we have that dorm-type of life with stuff always happening in our building. The teachers all live in this building, and the administration and couples with children live in the next resort like building. We have two floors of living, then the lobby and a restaurant and in the basement, the gym and recreation room. Like all couples here we have a two-bedroom apartment, so when you come to visit we can put you up; single people either get a one-bedroom apartment or a loft. People tend to not like the lofts; they are two-story with an open floor plan. I think if I was single I wont mind, especially if it was in Singapore, Sydney, Melbourne, New York City or wherever there was a city. We are out in the country, about an hour from Dalian or half an hour to Kai Fa Qu which is a city-suburb and fifteen minutes from Jinshitan but Jinshitan is not really an expat type of area. There are about 16 apartments per floor here at Campus Village and I think only a couple of them are empty. There is a guest apartment for when one of us need a place to put visitors  in-laws and people like that (down the hall and not in our apartment  just kidding mum/dad). There is a huge shopping mall being built not far away so that could make shopping easier though we prefer to go to the local Jinshitan market and haggle for already cheap as can be fruit and veggies. Then before long there will be the new city they are building, supposed to rival Hong Kong they say. There is a model of it which we keep meaning to slot in time to go see that is really quite impressive. With the new city there will be the new China movie industry headquarters. They have been building the infrastructures for years with huge freeways (everything done in China is huge) and lots of land clearing including the leveling of three large hills that I spoke of a few blogs ago. It will rise up between Kai Fa Qu and where we live here at Golden Pebble Beach. There will be a world-class yacht arena too. I think we are mid-way through a ten-year plan for that. then flowers are tossed on the bed and well us males from the school kept our hands to our self, and then the couple closes the bedroom door for a while and us male teachers as well as most of the female all have our thoughts and try to keep them in check. The parents have a bedroom too as the trip here is that the parents get together and buy a new apartment for the couple and I think when they get old one set of them gets to live with the kids. Not sure how that works out, perhaps they throw dice or arm wrestle to see which couple gets to do the old age thing with the couple. It all seems quite awkward with this one kid policy they have in China. At some point we all take off the slippers that were given us when we entered the apartment and head out to the bus and go to the reception. The reception was in a huge banquet hall with about eight people per table. I end up with about four other couples from our school and we just were plain silly. The beer was flowing and so was something that was about 60-proof, and it was only ten in the morning. There was lots of food and of course a plate of cigarettes on the round thing that the Chinese love to put on tables and that us westerns just spin around. 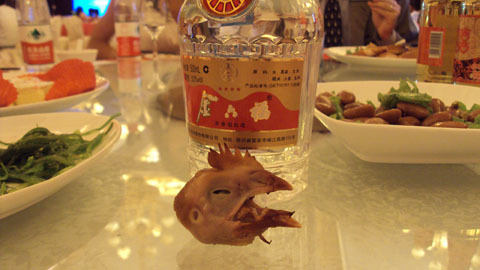 I guess I broke the silly barrier when they put the lone chicken head on the plate on the revolving table and I stuck a cigarette in its mouth and sent it for a bit of a spin. It is in the video  youll love it. I also like the part where the bride-chick comes around and puts a chocolate or a cigarette in each persons mouth (though she missed the chicken). That too is in the video. Overall we were there for several hours and got home late in the afternoon wishing we had another day to the weekend. Today, Saturday, Narda went off to Kai Fa Qu shopping and I had a day home puttering around. She came back with a printer/scanner, lots of food and bags of stuff. It is still hot here though I think it will cool down soon. Next Thursday I am off to Shanghai for a few days for an IT conference and Narda is taking a four hour drive with several of the women here to some really cool city north of here for a few days. It is a long weekend, with Monday some sort of national holiday. A lot of the people are going north to Dandong where the China-North Korea Friendship Bridge is. I really wanted to go but couldnt fit it. It is only a couple of hours away so Narda and I will go up in the near future for a weekend. And that is all from here for today. This entry was posted on Saturday, September 3rd, 2011 at 5:14 am and is filed under China, Dalian. You can follow any responses to this entry through the RSS 2.0 feed. You can leave a response, or trackback from your own site.